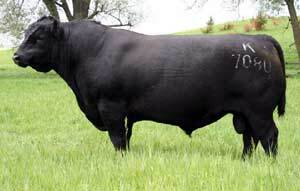 Extra 7080 is a 6.7 frame performance sire that should be used by serious breeders who want to improve their cowherd. 7080 will keep you in business for a long time...he sires stout bull calves that are scalebusters, and his daughters are the extra deep bodied, heavy muscled type that yet own lots of style, class, and fancy eye appeal. His Bushwacker X GT Max dam is a great female, and she is now a featured donor at Whitestone Farms, VA.